This post is a meditation on the confluence of belief, grief and love. It’s also about how research takes you into places of the heart as well as crevices of the brain. There are some stabs of wretchedness that all bereavements have in common. The brute sense of loss comes to anyone who loses a parent, a friend or partner, a child, a sibling or trust in someone they thought they knew. But what do you do with mess of feelings that darken your life when a pet dies? Mixed up in all the mess is shame. Pet-death is first-world problem. The drama in your home and heart is dwarfed by the crises in Syria, Yemen and all the humanitarian scars on the world map today. And yet, grief there is, and it must be dealt with. Anyone who has recently lost a cat may need to look away now. Rose La Touche of Harristown was named after the girl who inspired John Ruskin with devotion. (I urge everyone to read this definitive article by James Spates about the relationship between Ruskin and Rose. It demolishes the prurient myths that have served too long instead of truth). The human Rose La Touche died tragically young of a brain fever. 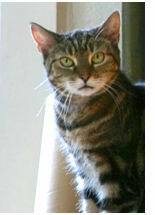 The feline Rose was a recycled rescue cat, so I could not be sure of her age. She was an inveterate tea-rustler. She liked it with milk and sugar, as I do. She hated pretty much everyone except me, and made her disdain quite clear, which was somehow gratifying. Anyone who telephoned me would be informed by Rose – nosing into the telephone mouthpiece – that any more than a few minutes of my time was an outrageous theft from her. During dinner parties she would sit up in the beams, sneering down at guests and sometimes flicking dust on to their plates. Rose struggled through her last year. She fell from one of the beams, tearing her side on an old nail, breaking both a leg and her spirit. She was never the same cat. She grew profoundly deaf. She became a night-howler and began to walk not like the Pink Panther but like a prematurely old lady. She had fits. Finally, I let Rose go. Even though I watched her die, I found could not quite accept that she was fully gone. 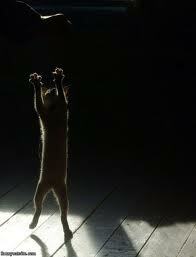 Painfully, I imagined her, like this image, dancing in the dark. Rose and I listened to a lot of Springsteen together, so this image has a sound track. 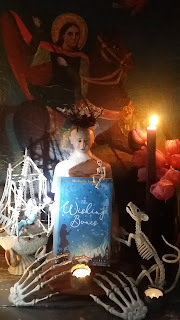 At the time Rose died, I was thinking a great deal about saints and relics, drafting out ideas for a children's historical novel that eventually became The Wishing Bones. It started as YA but I was asked to change it down to Middle Grade. So I faced the challenge of trying to explain the potency of saints' relics in a way that would make sense to a readership of relative young children of all faiths and none. ‘Relics are bits of saints: fingers, knee-bones, skulls, noses, ribs, toes and teeth. Relics can also be things that saints once touched or wore, such as shrouds, nails or sandals. The Venetians were mad for a bit of saint. ‘Mad’ is the only word I can use for it, because the Venetians loved those old bones and rags so much. But, like any fairy-story, the mad love of saints has a certain strange sense to it. Now I was brought up with these things and so do not think them so odd. But I do declare and admit that if a stranger were to arrive in Venice from a distant planet they would quite probably find our love of bones very hard to understand. So let me try to tell you how it started. In the very very old days, when the Christian religion was as new as a fresh laid egg, it was quite a risky thing to be a good Christian. It was against the law. To be an especially good Christian – doing good works like healing the sick – might bring you to the attention of the authorities and then you could find yourself in deadly trouble. You could even find yourself dead – executed by the leaders who worshipped the old gods. People who lived or died this way often became saints, the specially honoured servants of God. The holiest saints were the ones who were made to suffer horribly for their faith. These ‘martyrs’ were thought to be a bit like Jesus Christ, because he also died for his religion, nailed to a cross in Golgotha in the Holy Land. ‘Martyrdom’ was what also happened when the Romans tried to make the saints give up their religion and worship the old gods. If the saints refused, then the Romans would boil them in a bath like Saint Cecilia, or roast them on a gridiron, and tear their body with tongs and set fire to their hair, like Saint Eulalia, my own patron saint. The braveness of these saints won them the special love of God. This meant it was good for ordinary people to pray to them for help in difficult situations. And the prayer was even more powerful if you had a piece of the saint’s body to pray to. The saints might have died on earth; they might have been cut into pieces by those who hated and feared them, but their souls were still alive in heaven and could do you a rare amount of good. You could catch holiness yourself, like a cold, from these fragmented parts of a saint’s body. If you owned one of those pieces or prayed in front of it, you could also get special blessings and promises of great things to come. Every time a saint died, other Christians would try to touch a bit of his or her skin and even bones, just to get a smudge of holiness on their fingertips or even to graze it with their own eyes. Years and centuries after they died, these saints were still so holy that even one small morsel of their body, even a rusty drop of their dried blood, or a splintery bone from their nose, or one of their toes, was thought to be powerfully holy. So were the sponges and clothes dipped in their blood or their sweat as they suffered their tortures. Even after they’d been buried, if these saints were dug up, their bodies would be fresh and whole, and smell of flowers. Those bodies divided into as many pieces as possible so that lots of people could have the benefits. It may seem a gruesome and unkind thing to cut up these much beloved heroes and heroines, but usually the Romans had already broken their bodies, so they were not whole any more. And each piece was as important and as holy as the next. Every tooth and every finger was full of special powers to do rare good. And so these little pieces of saints were prized, and sold, and traded; wars were fought over them. What has this to do with Rose la Touche? Three years and three more books had passed and two new cats arrived, but I found myself still frightened of revisiting the pain of Rose’s death. Trauma’s like that: you get used to the knife embedded in your feelings and you know it will hurt more to pull it out. Even in memory, Rose was no saint. But I decided that I would see what it felt like to create something tangible in her memory, intending, of course, no offence to any religion. This was not entirely my own idea. 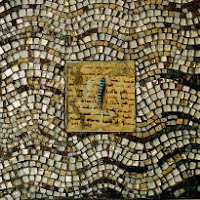 I had always admired the work of my dear friend, the mosaic artist Susie Nickerson Palmarin, and I asked her to help me. Much of Susie’s work plays on three themes interwoven by the media of found objects, mosaics, ink and mortar. 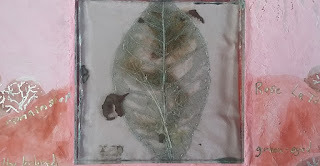 Venice is evoked in the theme of relics and reliquaries: small precious objects caught in glass. Literature is evoked by words in mosaic form: letters as tesserae, words as painting, and painting as words. The rhythms of the spoken word are preserved, expressing the artist’s conviction that writing is in itself art. 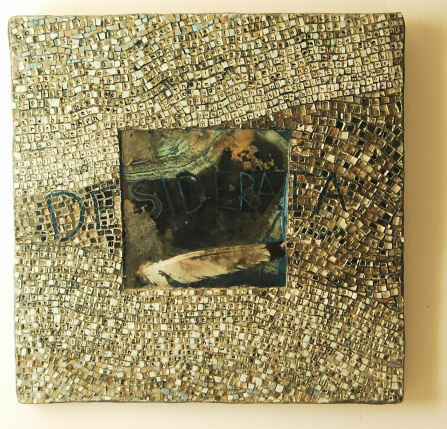 Finally, the artist brings into play the nature of her own medium, the mosaic itself: an interplay of colour and texture, light and concealment, and softness and permanence. 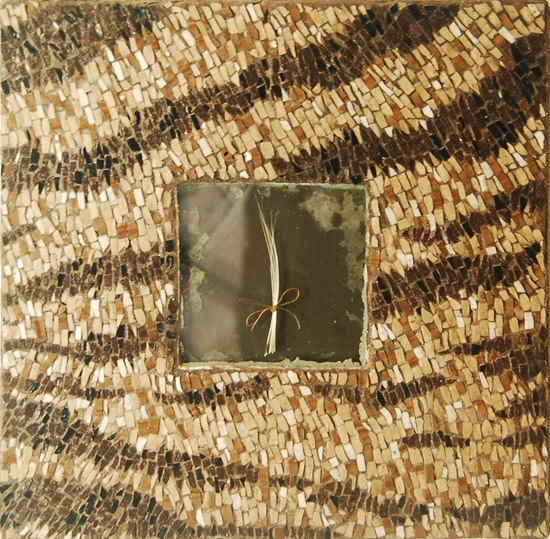 Susie had made a mosaic reliquary for her own beloved cat Arturo after his death. 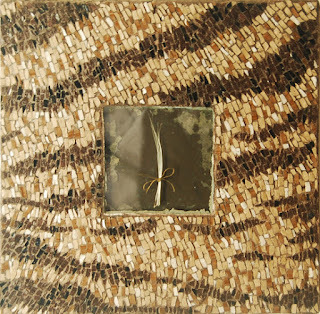 In this beautiful piece, she created a frame of tiny tesserae that simulated Arturo’s tabby fur. In the centre, she set a tiny white funerary bouquet of his whiskers, which she had saved over the years. I too had a collection of whiskers, some translucent half-moon nails and the fur the vet shaved from Rose before administering her final injection. Susie offered to make a memorial piece that literally incorporated Rose. It would be different to Arturo’s memorial as Rose herself was of course very different. Arturo and Rose were both tabbies – but one was born in Venice and one (I guess) in South London. Susie immediately asked me for some words to put into her artwork and to guide her. But I was still tongue-tied with grief. The words had fled. Like all novelists, I write about loss persistently, as the changing rhythms of gain and loss shape every story. But faced with the actual aching absence of Rose la Touche, words seemed trivial. As for writing something ‘artistic’ or ‘poetic’ – that was not appropriate to the continuing brute reality of Rose’s absence. What I was feeling could not be accessorized, elaborated or made picturesque. Yet it was quietly and sometimes loudly omnipresent, like certain kinds of physical pain. Last year French artist Sophie Calle produced a kind of reliquary for her cat Souris. Calle, famous for her multi-disciplinary collaborations, did it her characteristic way. When Souris was close to death, Calle called on a friend to whisper the words of a song into her dying cat’s ears. Later, she requested a full song as a tribute to Souris. Then Calle asked her friend Laurie Anderson to write something. Offers flooded in from other friends and people who heard about the project. They happen to include Bono, Pharrell, Jarvis Cocker and Jean-Michel Jarre. An album evolved, Souris Calle. Some of the 39 contributing artists knew Souris in life. Others were briefed about her with photographs and a video that Calle prepared about her life with Souris. Here’s a sample. The songs and associated artwork turned into an exhibition in Paris. And nor am I. But like Calle, I felt the need to respond to the loss: to create something lasting from my memories of a cat who lived too short a life. So how did Rose’s reliquary turn out? Having given Susie the raw ingredients of fur, whiskers, claws and love, I asked her to surprise me. And she did. 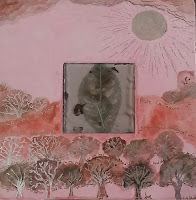 She chose a rose-coloured gesso background and on it she too imagined Rose – housebound in real life – running through a forest of trees in the light of a setting sun – that time when cats are most twitchingly themselves. She set Rose’s corporeal relics into a silver skeleton of a leaf. The words I finally delivered were without sentiment, Susie reproduced them on the front and the back: Here lie the remains of Rose La Touche of Harristown, the beloved green-eyed tabby of Michelle. No-one knows where she was born but she lived from around 1997 till 2011. She will never be forgotten by anyone who met her and she is sadly missed, sadly missed, sadly missed. And yes, she still is. But the reliquary helps. Made with Susie’s love, including the immortal parts of Rose, it really does. 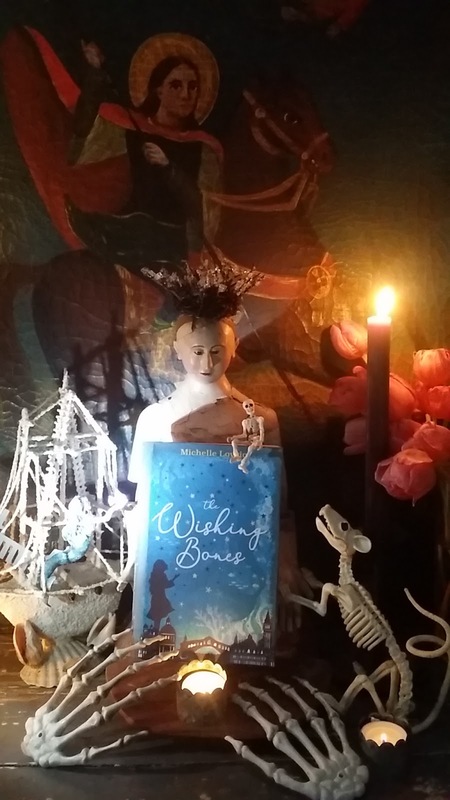 The Wishing Bones is published on July 25th, 2019. The extract above is from an earlier draft. I'm afraid I don't know the source of the image of the cat dancing in the dark, but happy to add credit if someone can identify it. Beautifully touching. 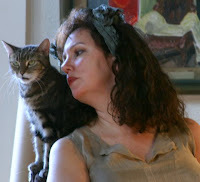 I have one Save from the many many felines who chose me as companion over decades past. It's a simple Tin box containing the pulverized bones of an especially beloved "Little Mary" who died in the late nineties. I lost my dog last week. She was almost 18 and I miss her a lot. Thank you for this post. Oh I am so sorry about your dog, and about Little Mary too. I was quite worried about this post - it was hard to find the right way to talk about this subject. Thank you for reassuring me. Michelle, you said what was in your heart. Nothing that comes from the heart needs to be a worry. I lost my best furry friend so many years past I don't want to think of how long we've been apart. I find myself happy in the memories of padded feet and attentive ears, and immediately saddened by thoughts of those last days. What a beautiful reliquary, and what a beautiful post. And I'm very happy that you, too, are a Springsteen fan. 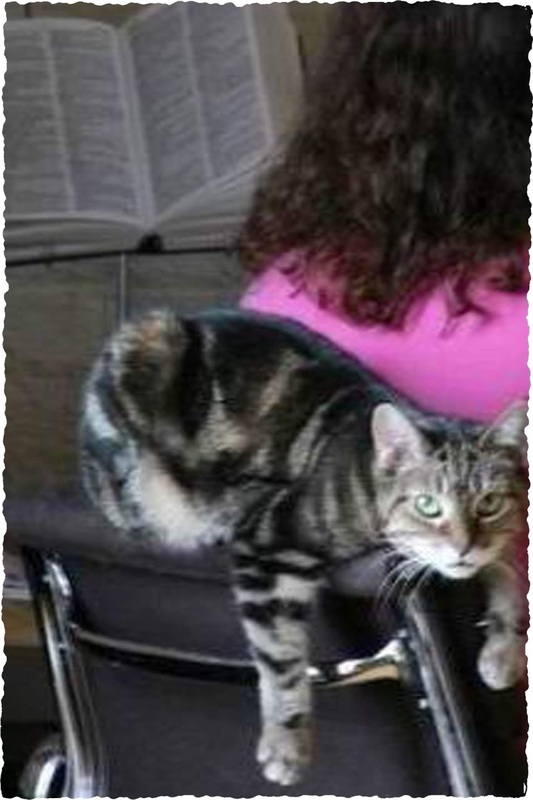 I will always remember how you lit a candle in a church in Venice when my cat Katie died - thank you for this post. My father's war: "They alone did not surrender."